In many ways, training to hypertrophy a muscle is simple. Put the muscle under tension with load, continually recruit muscle fibres with contractions, fatiguing them in the process, recover and rebuild by taking in calories. But many struggle to grasp this process and spend months, or even years not gaining a pound of muscle. I think people now days have so much available training information via the internet, forums, blogs, magazines, social media and advertising, all trying to promote the latest “Results Guaranteed in 10 Days” training plans, that it’s easy to be led astray. Back when Arnie and Lou Ferrigno were going head to head for Mr. Olympia they had none of this. They kept training simple, were consistent, and progressed sessions week-by-week, month-by-month. I’m sure they wouldn’t read Men’s Health on a Sunday night and think, I’ll follow this “21 Days to Bulging Biceps Plan”. Don’t get me wrong you have many training variables and protocols available to you to hypertrophy a muscle. I’ve used protocols such as GVT (German Volume Training), drop sets, giant sets, pre exhaust, negatives, 5X5, FST-7, pyramid sets to just name a few. They all have their benefits, and if done correctly they will all promote muscle gains. 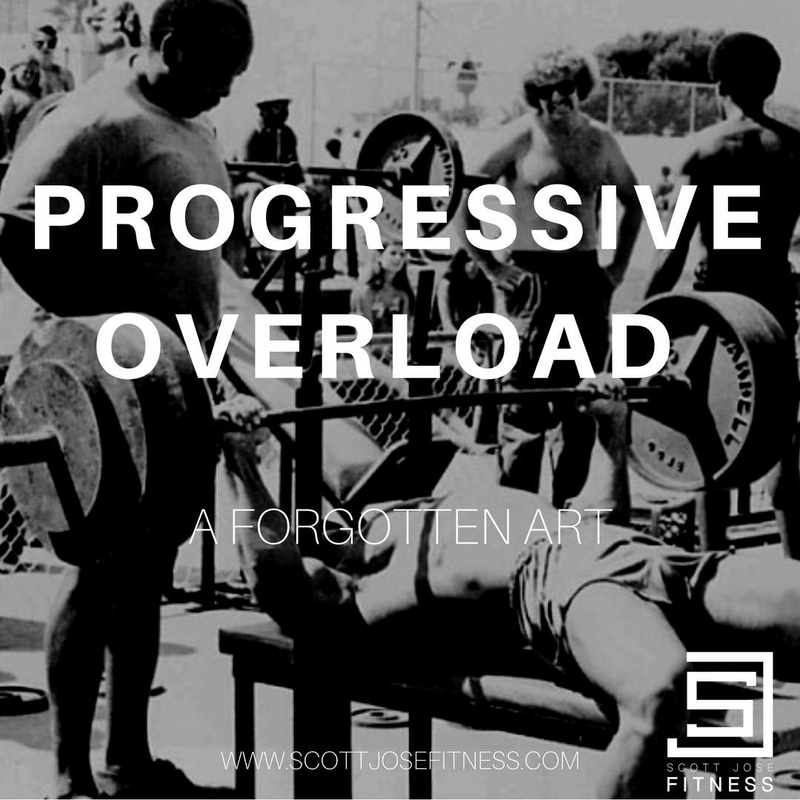 However, whichever one of these protocols you are using, the main factor to continually gain muscle is PROGRESSIVE OVERLOAD. If you are currently going through a pyramid set training phase for example, lasting for 3 weeks, each time you repeat a session your aim should be to beat your weight or reps from last week. Before we jump into where you can progress for next week, the most important thing about the above is that the weights and reps are recorded. Every time I’m training in a gym I will be the only person recording my session. How the hell do you expect to progress? And another thing, Monday is chest day, you walk in and do some incline DB’s, cable chest flyes and press-ups. Next week on Monday, chest day again, you do dips, pec dec and decline smith machine. Either you change your program every single week or you just wing it. I’m going with you wing it. You have nothing to beat or follow on from by doing this. Writing a training plan for the week ahead takes 2 minutes, copy that plan for 3-6 weeks and then change it. Trust me your results will go through the roof with a little planning and organization. Now, to the recording of the incline barbell chest press. Set 1 and Set 5, you used 60kg with a target rep range of 12-15. Both sets you hit 15 reps, this shows that 60kg was too light. Up it for next week, even increasing to 62.5kg total will be progressive overload and lead to greater hypertrophy gains. Set 2 and 4, the 70kg 10-12 rep sets. You got an 11 and 10. As you are close to the lower end of the rep bracket (10 reps), stick with this weight but aim to get more reps on both sets. Set 3, the heaviest set, 6-8 reps. You got 6 reps, now you do not want to go any lower on the reps as you’ll be under the required bracket. You’ll have to gauge how you are feeling in the sets building up to this one. Feeling strong, up the weight ever so slightly, or aim to hit the higher end, 8 reps.
That is how simple it can be. Nothing fancy, all you’ve done is aimed to beat weights or reps from the previous week. Personally I love the competitiveness of trying to beat my previous recordings. It makes me train harder, I have target in mind to achieve before the set even starts. I know full well I won’t be copping out mid set as I’m going through the motions. I would advise every single gym goer, especially those training to gain muscle to buy a note pad, spend 5 minutes on a Sunday evening to write your plan for the week ahead, and progressively overload every session over the course of 3-6 weeks. At this point you’ll need to change your program. This will maximize results, training intensity, training efficiency and your time in the gym will now be rewarded with better results.